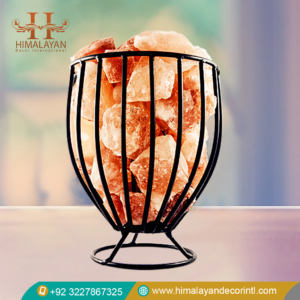 Truly aesthetic and highly portable, basket salt lamp is another unique category of our Himalayan salt products. 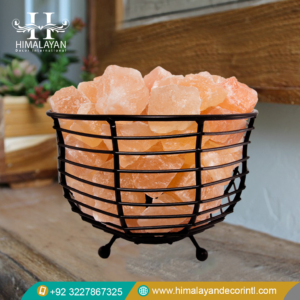 Himalayan Decor International introduces a beautiful and light-weight salt lamp style. We manufacture elegant shapes of salt lamps with a metallic basket having air purifying quality. Casting a fireside glow around us, these Himalayan salt lamps are a source of mind therapy. 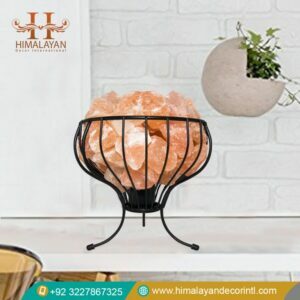 Sort of Himalayan basket salt lamp offers a unique and aesthetic way of introducing the salt product at home. 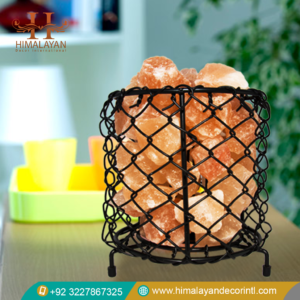 A metal basket having salt chunks and a bulb in the center have all the properties of an effective Himalayan salt ionizer. More interestingly, the basket salt lamps are lightweight and easy to be placed on elegant glass shelves without being conscious of any damage. We introduce various designs of baskets with salt lamps. The black polished bowl style metal basket with salt pieces is quite a popular salt product, whereas the cylinder shaped basket lamp is also feasible to secure small salt chunks. The floral and oval framed basket designs truly fascinate while placing as a table centerpiece. As the rise in demand indicates the increasing popularity of Himalayan salt lamps. Not just they look oomph but the health benefits associated with them are their major attributes. If you are considering to buy a floral, bowl or even any other metal framed basket salt lamp, then it would be a perfect match for your home/office interior and event decors. Create a super calming glow into your bedroom for better sleep and have a refreshing wake up with natural salt products. Our offered basket salt lamps modernize the entire look of an ordinary living area. Also, they are much convenient decoration to be used in offices for adding an impression. Along with this, you might be wondering to explore the health and environmental advantages of this natural air purifier before buying then proceed the reading.